The Queen of England is set to unveil an updated website on February 12th. The site is reportedly going to make extensive use of Google Maps. "We have integrated the royal diary with Google maps. This means that if you hover [the computer mouse] on, say Birmingham, it will throw up all the past royal visits to the city – at the moment going back to 2005 – as well as future royal visits for the next two weeks. This will be called: 'Royal family in my area' and we hope it will prove very popular with the public. People will be able to enter the member of the Royal family and the date to get the information they need." I just want to know how many visits to Birmingham the Queen has got planned in the next two weeks and, if she has been there before, why is she planning to go again? The Australian Broadcasting Corporation has used its extensive archives to produce this stunning interactive map exploring the history of Sydney's inner-city streets. Working with the National Film and Sound Archive, the Powerhouse Museum, the City of Sydney, the Dictionary of Sydney, the State Library on NSW and the Museum of Contemporary Art, ABC have been able to create a history map full of audio, video and photographic records of Sydney's past. Each marker on the map offers a selection of audio, video or photographic evidence about that location's past. It enables the user to explore the history of Sydney - where it actually happened. That on it's own would make this site an invaluable resource for those interested in Sydney's history but the site also has a mobile service, so you can view historical information about the city whilst actually walking on the very streets, and a download section, so you can download audio and video to view on your mobile or handheld player whilst you walk about Sydney. 4.5 magnitude earthquake occurred in the Seattle and Puget Sound area early today. 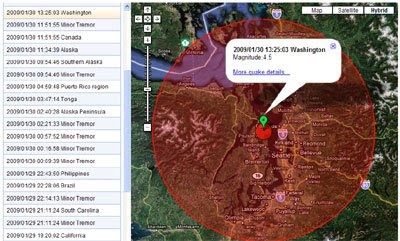 Here are a number of Google Map mashups where you can view information about the Seattle earthquake and find out about other earthquakes around the world. This Google Map plots data from the US Geological Survey. A coloured polygon is drawn to represent the size of each tremor. For those of you interested in volcanoes here is a Google Earth gadget showing Redoubt Volcano in Alaska. Geophysicists are predicting that Redoubt Volcano could erupt soon. If you wish to add the gadget to your own site cut and paste the html code below. EarthSwoop have created this Google Earth browser map of some of the man made wonders of the world. The map includes amazing 3D views of the pyramids, the Taj Mahal and many other sites. After Google sportingly deleted the image of an Australian man on the toilet I've had to find another Street View of the week. In the end I went with this rather fetching self-portrait of the Street View car. How did it manage to take a picture of itself? Whilst we are on the subject of Street View you might have heard about the deer that was hit by a Street View car. Google have now, understandably, removed the images. Street View Gallery however did manage to get some screenshots before they were removed. Wired have an interesting story about how Swiss police managed to spot a field of marijuana on Google Earth. Police discovered the hemp field in the north-eastern canton (state) of Thurgau last year using Google Earth's satellite images. Consequently 16 people were arrested and the police seized 1.2 tons (1.1 metric tons) of marijuana. Coincidently, shortly after reading the story of the Swiss police using Google Earth to find a field of marijuana someone sent me a link to a video of an iPhone game called Drug Lords. In the game players try to build a drug dealing empire. The game seems to have a multi-player element and uses Google Maps to show other dealers in your neighbourhood. I don't have a link for the game so if you are interested you'll have to try and Google it. 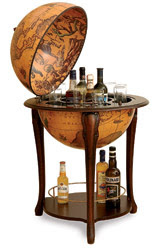 I've always wanted one of these globe bars. However at $299 I think I'm going to have keep dreaming. At $39.99 these map chests are more within my reach. The Chicago Transport Authority has a really cool real time Bus Tracker that shows bus routes in Chicago and the real time position of buses in the city. Harper Reed has managed to work out how the map makes calls to CTA's underlying bus data and has built an API on top of the data. This means that anyone can now produce their own mashup using CTA's data. One example of a mashup built with the data is the CTA Bus Tracker for iPhone and iPod Touch. Also created with the API is the Chicago Bus Tracker Widget. Ryan A Graves.com also has a really cool article on how Harper went about hacking the CTA Bus Tracker Map. Google have sportingly removed a Street View image that caught an Australian man sitting on the toilet. 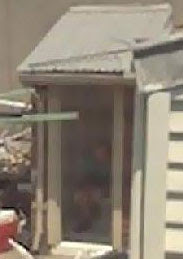 The Street View camera caught the man as he was sitting in his outhouse in Port Melbourne, Victoria. Anyone who uses an outside toilet with the door wide open is hardly likely to be concerned with privacy issues, I therefore assume Google removed the image to protect the delicacies of other users of Google Maps. Radio Aporee is a nicely presented sound map from Germany that has already mapped 3491 recordings. To listen to a recording it is possible to search the map by location or you can just use the I feel lucky option and listen to random recordings. To add a sound you just need to click on the map and upload a recording. Radio Aporee also have a number of walks recorded. These take you through a number of sounds that can be heard on a particular walk. After one sound has played the map then animates to the next recording. I recommend taking a walk through the Stadtgarten. Storage Seeker is the first Google Map mashup I've seen that can help you find storage facilities. Moreover it has a number of very nice features. To find storage facilities the user sets their location. Storage Seeker then displays on a map all the facilities within five miles of the location. The first cool feature of this map is that the facilities are listed in the sidebar in order of proximity to the set location. So you will find the facility nearest to you at the top of the list. The second really cool feature is that the storage facilities that you select in the sidebar are then given a different colour marker. The user can therefore see very easily which facilities have been chosen so far. Storage Seeker hopes in the future to also be a comparison website so that users can not only find the nearest storage facilities but also compare unit prices and access to the facilities. Mibazaar has created this Layoff Tracker to show the effect of the downturn on US jobs. 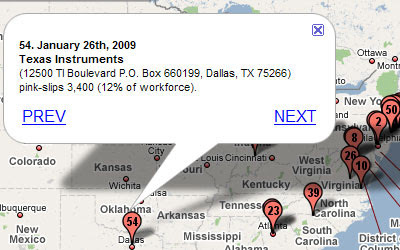 The map shows layoffs for January 2009 at America's 500 largest public companies. That is 138,252 job losses in total in January alone from just 500 companies. The companies are marked on the map based on the address of their headquarters, which may not necessarily be the location where the jobs have been cut. I think there is an opportunity here for someone to produce a Google Map mashup showing current unemployment rates in all the US states. SpotCrime Timeline of London Shootings from Keir Clarke on Vimeo. SpotCrime now provides crime maps for over 200 cities. The Real Ale Hunter is a directory and Google Map mashup of real ale serving pubs in the UK. The directory holds reviews of over 5000 pubs that sell real ale in the UK and all of them can be found via a Google Map. It is possible to zoom in on any area of the UK and real ale serving pubs in the current map view will be tagged on the map. Alternatively it is possible to select the option to 'view by town'. This option will zoom the map in on an individual town and that town's pubs. The pub's in the current view are listed under the map. Each listing has the pub's name and address and a rating for the pub. Some pubs also have more information, such as the number of pumps and information about whether it is listed in the Good Beer Guide. If you ever find yourself in Europe and you fancy a beer you could do worse than consult the European Beer Guide. 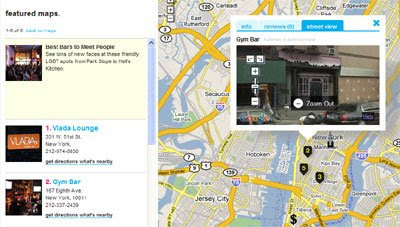 The site uses Google Maps to help users navigate to beer guides for individual countries. Each country is tagged with a link to the section about that country. Clicking on a country's link takes you to the pub guides for that country and to brewery and beer guides. As beer and brewing traditions vary greatly throughout Europe this website is an essential guide for any beer drinkers planning to undertake a European wide pub crawl. The Livermore Valley Winegrowers Association has created a cool Google Map mashup to help visitors to the area plan their visit. To use the map users enter a starting address and the date they wish to visit the Livermore Valley. They can then explore the mapped wineries and vineyards by clicking on the map markers. If any of the wineries grab the user's interest they can then press an 'add' button to add the winery to their itinerary. When the user has selected all the wineries they wish to visit they can drag them around and place them in any order. Once finished it is is possible to get driving directions for the visit. Just get somebody else to drive! 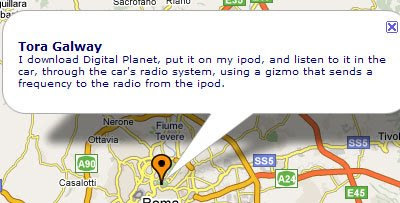 This week's edition of the BBC World Service's Digital Planet is all about the Geographic web. 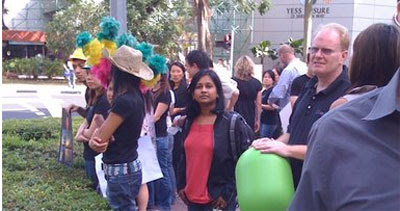 The programme includes an interview with Marcello Quintella, a geo project manager at Google’s Brazilian Headquarters. In the programme Gareth talks about some of the latest geographical features available on your mobile phone, including Google Maps and Street View. You can listen to the podcast of the programme here. 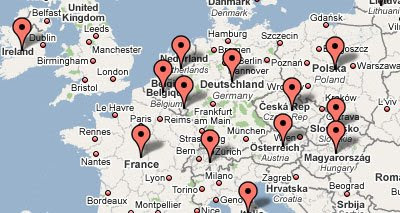 Because this is a special all about the geographic web there is also a Google Map of listeners. Digital Planet wants to know where their listeners are, so they have created this Google Map, to which you can add your location. QuoVadis Live! allows anyone to map events and tours. 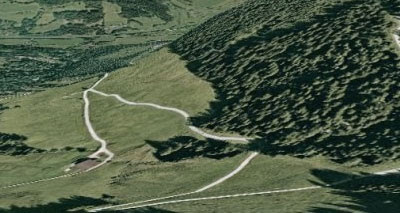 The resulting maps include nearby hotels and Panoramio photos. 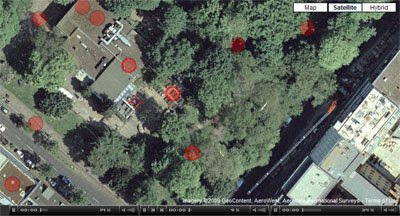 As well as mapping music and sports events and tours QuoVadis can also be used to show the locations used in feature films. The Filming Locations category allows users to map movie locations, attaching any relevant clips from YouTube. 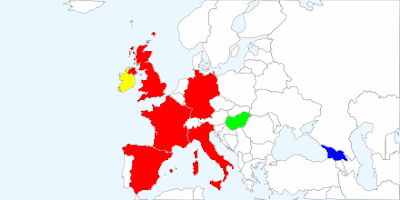 This example is a map showing the locations of John Borman's 1981 movie Excalibur. Filmaps is a new film locations website that also uses Google Maps to show the locations of movies. Filmaps want to help movie fans find the locations in their favourite movies. It is possible to search Filmaps for a particular film or it is possible to search a location to see which film was made there. 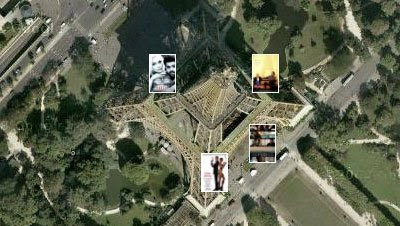 For example, a search for the Eiffel Tower reveals that four films in the Filmaps database have used the famous landmark as a location. Each film has its own Google Map. When you are browsing a film's locations it is very easy to add another location if you know of one that hasn't already been added. To do so you just press the 'add a location button' and complete a very short form. Meipi have a Cinemadrid map that includes a number of locations from films shot in the Spanish capital. There are a lot of locations from Almodóvar's films on this map. Clicking on a film will load a YouTube clip of the relevant scene. Brian Lane's MovieLandmarks.com is a "location-based movie landmark search engine". 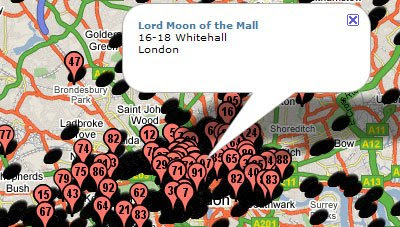 Location and media data are added by users and the resulting data is then mashed up for all to explore! For an example check out this Blues Brothers landmark. A New York movie map, described as "..Your guide to filming locations in one of the greatest cities in the world. Featuring locations for 132 scenes from 72 different movies and television shows, and growing." For more TV & Movie maps search under media in the Google Maps Mania Directory. Tomorrow is the start of Berlin Fashion Week but if you want you can kick off the festivities tonight by visiting model Iekeliene Stange's photography exhibition 'I Like Ponies'. This is just one of the many events taking place during Fasion Week which are geo-tagged on this Google Maps mashup. 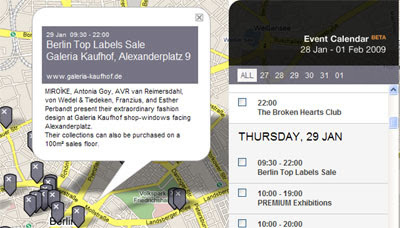 The Berlin Fashion Week Map was created by modabot, a German blog about avant garde fashion. The map is a very good example of how to build a map around a calendar of events. The event calendar for the Fashion Week sits on top of the Google Map and it is possible to view markers of the whole week's events or just those of a particular day. UFO from Keir Clarke on Vimeo. Microformats.dk has created a Google Earth browser plug-in application that shows the flight of a UFO over Copenhagen. The simulator is modelled on the excellent Path Tour Simulator, showing a tour of the Formula 1 race track at Silverstone. The UFO Route Simulator is in Danish but is very easy to use. Click "Indlæs UFO Data" to load the kml of the route. A pop up appears saying "OK" when the kml has loaded. Next just press the "Start" button" to start the simulator. It is also possible to load other kml routes into the simulator. For example if you've ever wanted to see a UFO skiing - load this kml into the simulator (right click and copy link location). This kml is of the world's most dangerous ski run (see below). Kitzbühel is said to be the most dangerous downhill ski run in the world. If you want to know how dangerous it is you can watch a first person video of the run as seen in the Google Earth browser. You can watch the video at 20minutes.Fr (translated into English). 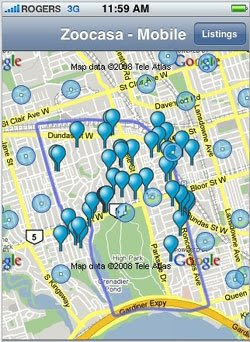 Zoocasa, the Canadian real estate and Google Maps mashup, has released an iPhone application. 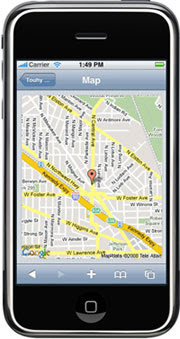 The application allows users to find homes near their current location using the iPhone's built in GPS. The available properties are shown on a Google Map. It is possible to get descriptions and photographs of each property and it is even possible to get directions to help you find a house. House hunters can search for available properties on their phones by price, number of bedrooms and by location. The application is available from iTunes. Canadian newspaper The Vancouver Sun understands that a Google My Map is often the perfect illustration for an on-line news article. For example, what better way to illustrate an article on the Best Ethnic Restaurants in the City than to provide a Google My Map showing the location of all the restaurants. Other recent examples of My Maps created by The Vancouver Sun include this map of a bridge closure and alternate traffic routes and this map of Vancouver's Best Chinese Restaurants. To coincide with Australia Day and India's Republic Day (Monday) the Moon has decided to do a fly past of the Sun. Western Australia, the south of Africa, southern India, Antarctica and South East Asia will today be able to see an annular solar eclipse. The only reason I know this is because HeyWhatsThat has updated its Cosmic Visibility and Planisphere sites with this year's solar and lunar eclipses. The Cosmic Visibility site uses Google Maps with its sky maps to bring the night sky to your web browser. Go to Cosmic Visibility and select an eclipse on the left, and use the "+" and "-" under minutes and hours to see the Moon pass over the Sun or through the Earth's shadow. The Planisphere site generates KML files which you can view in Google Earth's sky mode. Go to Planisphere to set your location and request a KML file for current conditions or one of the solar eclipses. 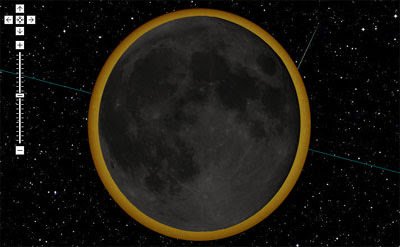 For the lunar eclipses and other options, use the Advanced Planisphere site. Hurricane force winds have hit Europe in a storm that has stretched from the Channel Isles to Barcelona. The storm has already caused a number of deaths and 1.5 million homes in France have suffered power cuts. 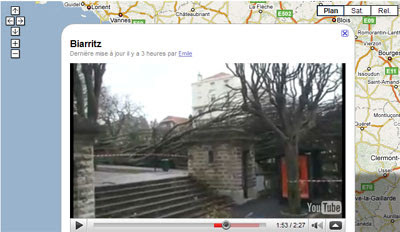 French blog 20minutes.fr has put together this video map of southern France. The map includes a number of embedded YouTube videos that were shot during the storm or that show the devastation caused by the winds. Last week Google added new bathymetry data to Google Earth. Yesterday the data was also added to Google Maps. Mapperz has a nice round up about how the new imagery has been received by some Google Earth users and developers. 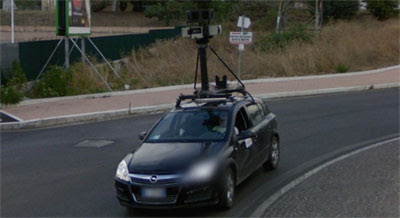 Gran Canaria Info have published photographs of the Google Street View car in the Canary Isles. They say one car has been spotted on Tenerife and one on Gran Canaria. The second meet-up of GeoMob is on the 29th January. Unfortunately I think registration is now closed. I will be attending so I hope to report back next week on what looks to be another interesting line-up of talks. Russell Middleton from the Google Geo team, Andrew Scott of rummble.com and Alfie Dennen from Moblog are the main speakers. This time around Yahoo are hosting the event and the theme/meme for the evening is the connection between Location, Context, and Device. Aneki.com have developed a very simple interface to create Google Chart API maps. Using the interface it is possible to create customisable map of the world, Africa, Asia, Europe, the Middle East and South America. To create a map you just select from a range of colours and press a button - and that's it, you have a customised map. Romanian website Norc have launched a Street View type service for five European countries. 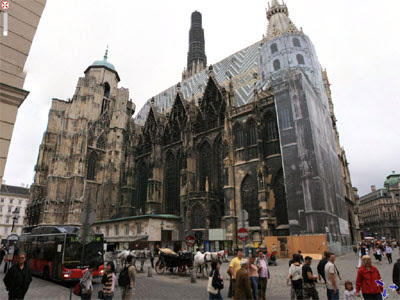 It is possible to use Norc to virtually walk around a number of major European cities, including Vienna, Prague, Bucharest and Warsaw that are not yet covered by Google Maps own Street View. Norc's Street View type service is itself built on top of Google Maps. In essence Norc provides a huge number of interactive panoramic images that are mapped to a real world location. Each image then contains links to surrounding panoramas, which enables the user to virtually walk around a city. I hear that teenage boys love pitching their tents in Morningwood Lane, Antioch. A 3km wide poem saying, "neither shame nor fear" by Raúl Zurita can be seen in Google Maps. The poem was written with a bulldozer in the desert sands of Chile. Street View Coming to Singapore? This Picasa Web album seems to suggst that Singapore will be getting Street View sometime this year. Office Evil has developed a proprietary algorithm which can mark any incident of rage on a Google Map for the amount of time proportionate to the “level of rage” stemming from the said incident. AND ABOUT TIME TOO! The Office Evil Map of Rage is a real-time barometer of office rage around the world. The map pinpoints the exact location, circumstances, and level of outrage for each specific occurrence of office rage. To map your rage just click on the map and enter the details. Alternatively you can submit you anger via Twitter. 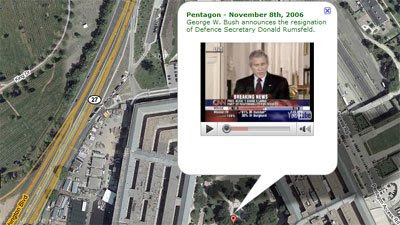 This Google Map mashup is a record of George W Bush's presidency shown in YouTube and Google Maps. The map animates through key scenes in Bush's time in the Whitehouse, for example his inauguration speech in 2001, the moment he is informed that the World Trade Center has been attacked by terrorists, his visit to New Orleans to view the damage caused by Hurricane Katrina and the very recent shoe throwing incident in Iraq. Whatever your politics this is an apt reminder of the last eight years under President George Bush. "The End of the Line" is a film based on a book by former Telegraph environmental editor Charles Clover. The book and the film is about overfishing, the bad guys, the good guys and what you can do to help ... think "An inconvenient Truth" but about saving fish. 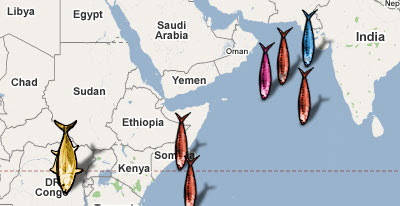 This Google Map mashup is the main tool of the film's campaign to create awareness and hopefully get your pledges towards sustainable fishing. To pledge your support you can claim a piece of the ocean. The map then becomes a symbol of the communal responsibility we all have towards saving the ocean. Clicking on the fish markers of people who have already pledged their support reveals what people have pledged, for example to write to government officials, ask about the provenance of the fish they eat, etc. In a similar vein to End of the Line this Google Map mashup allows individuals and companies to put a green marker over your home or business to tell the world that you have gone green. You can click on any of the map markers to read the profiles of other homes, businesses and organizations that care about the environment. 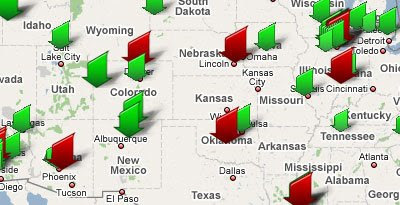 The green markers on the map represent individuals. The red markers represent businesses and non-profit organizations. New York City’s official marketing, tourism and partnership organization NYC & Company have today launched a major initiative on their website nycgo.com. The initiative is an amazing Google Maps mashup of New York City. The map initially shows a number of markers highlighting tourist destinations around the city. Clicking on any of the markers automatically takes the user to the nycgo.com page about the destination. However it is also possible to load a number of 'featured maps'. These maps are the Best Bars to Meet People, Lin-Manuel Miranda’s In the Heights Tour (the five best spots in Upper Manhattan to have your own In the Heights experience), Green Beer (environmentally-conscious bars), The Jimi Hendrix NYC Experience and Rockin’ Roots (rock venues). With nycgo.com as well as using Google Maps to get directions to attractions throughout the City, you can even send the info to your phone with Google Maps for mobile. So if you are planning a trip to New York City visit nycgo.com before you go. The National Resources Defense Council has a vision about how it is possible to begin to remake America. It wants to use money from the stimulus package to encourage smart growth and transit. To help communicate their vision the NRDC have created this Google Map that details 70 communities that could be transformed into more livable, sustainable places, if development happens in a careful and forward-thinking way. The NRDS map of the United States highligts 70 locations across the country that are ripe for transformative change. 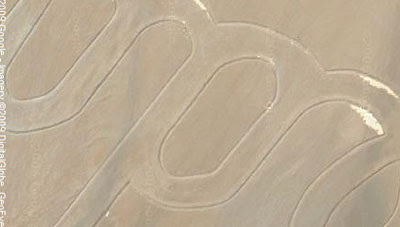 It is possible to zoom in on any of the 70 locations and see the satellite view of the existing site. The map marker for the location gives some context about the metro area, and presents a brief slide show demonstrating how each location could be converted, step-by-step, from sprawl, vacant property or disinvestment into a lively, beautiful neighborhood. Even though we are still a couple of months away from the start of the 2009 Formula 1 season there seems to have been a recent spate of Google Maps mashups created around the sport. This mashup is a Google Map showing all the racing circuits on the 2009 tour. All the season's Grand Prix circuits are listed in the map sidebar in chronological order. Clicking on any of the circuits zooms in the map to show the satellite image of the circuit. Formula 1 in Google Earth from Keir Clarke on Vimeo. As you can see from the video the simulation allows you to view the Silverstone circuit from the perspective of a Formula 1 driver. The user can adjust the speed of the car as it drives around the circuit and can also change the camera angle. If you live in London and you are looking for somewhere to live then you should use this great new Google Maps mashup. Where Can I Live uses Nestoria's property database to help London house buyers find properties that are within a set commuting time from where they work. To search for properties the user enters their work address, the length of time they are willing to commute and the type and price of property they are looking for. Where Can I Live then returns a list of properties matching the entered criteria. You can also use Where Can I Live to search for property listings around any chosen station and for more fun stuff like looking at house price statistics. 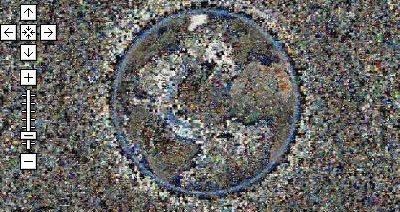 This mashup shows a mosaic of 5000 photographs tagged Maps, Space and Aerial loaded into Google Maps. CASA's Image Cutter software was used to replace the Google Map tiles with the 10,000 x 6000 pixel mosaic image. 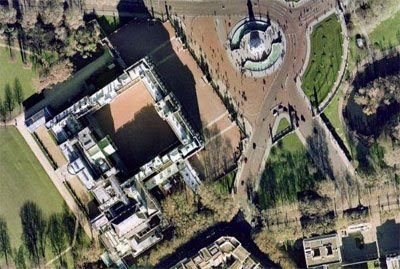 GeoEye have released a satellite image of the National Mall in Washington DC taken this morning at 11.15 am. If you wish you can view the satellite image in the Google Earth Browser and even embed it in your own website or blog by loading this KML in the Google Gadget Embedded KML Viewer. CNN.com is mapping personal accounts and stories from the inauguration in Washington. CNN also used Google Maps to chronicle Obama and Biden's Whistle Stop Tour from Philadelphia to DC. 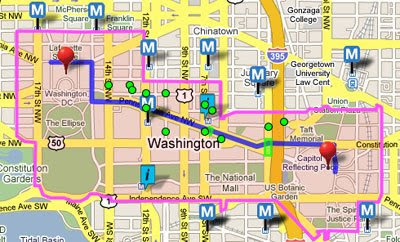 The Inauguration Day version of WashingtonPost.com's innovative news mapping platform will geocode real-time photos, video and blog posts. The Washington Post have more than 30 photographers and videographers in the field reporting on the inauguration. A team of 40+ reporters will be deployed through out the city providing information that will be compiled and delivered into TimeSpace with location specific information. 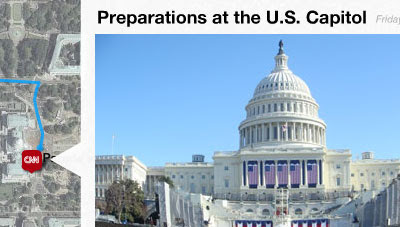 Oprah.com - On-the-Scene Updates from Washington D.C.
Oprah has sent a team to D.C. to meet people and visit the inauguration hotspots. They have used Google Maps to map streaming videos of their interviews. The Wall Street Journal's Google Map showcases a full inaugural guide to events and other things to explore in the District. Ipoki have produced an automated Street View tour of the Inaugural Parade route. This means you can just sit back and follow the tour virtually with Google Map's Street View imagery. News.com.au have also put together a great Street View "walking tour" of the Inaugural Parade route. News.com.au have provided directions of the route so you can follow along using Google Map's Street View navigational tools. CNN have a map of the parade route to which they are going to add personal stories and accounts from the public. 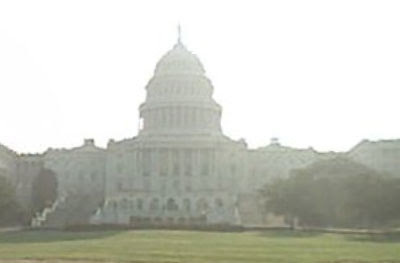 At the time of writing the map just has the one marker, showing the empty bleachers outside the US Capitol. However the bleachers and this map won't be empty for long. 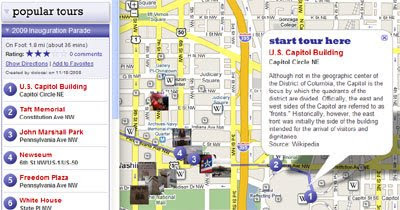 About.com have produced a Google Map of the 2009 inaugural parade route. The closest Metro stations to the route are marked on the map. The map also shows areas restricted to pedestrian traffic, security checkpoints and the three pedestrian parade route crossovers. If you are planning on visiting the opening inaugural ceremony at the Lincoln Memorial then check out this map of restricted roads first. The map shows the roads closed, those that are allowing resident vehicles only and roads that have no parking. The map is based on a map released by the District of Columbia Mayor. This map from Capital Spice has mapped the 213 restaurants, taverns, hotels and nightclubs in Washington that have been given extended opening hours during Inauguration Weekend. This means that these establishment are able to stay open 24 hours a day from Saturday, January 17th through 4 AM Wednesday, January 21st and sell alcohol until 4 AM (as opposed to the usual 3 AM on weekends and 2 AM on weekdays). 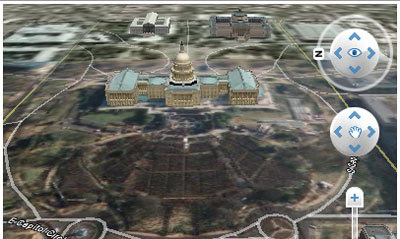 If you are planning a visit to Washington you have to check out this superb Google Map mashup. The map includes a number of historic custom walking tours of Washington, illustrated with Flickr photo feeds and Wikipedia entries. The latest tour is the 2009 Inauguration Parade Tour. The tour includes a number of markers that help to explain some of the sights that can be seen along the route. 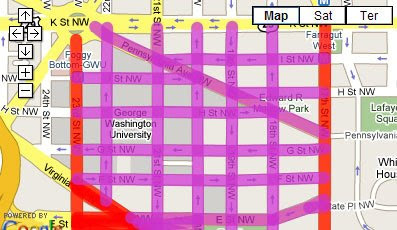 Fox have used Map Channels to produce this Google Map showing the route of the inauguration parade. The map includes street view which should help you find the perfect position to watch the parade. Mibazaar has created a number of Google Map related mashups for the inauguration. This video map allows you to check out what and from where the world is uploading videos to YouTube about the inauguration of Barack Obama. Also from the same map creator check out Barack Obama's Journey from Honolulu, HI to White House. TrafficLand has a Google Map with clickable traffic cams and the Google live traffic overlay. You can therefore use this map to check out the current traffic conditions at many Mall area and parade route locations. Of course if you are planning to visit Washington in the next few days you shouldn't drive. Take the Metro instead. This Google Map mash-up has replaced the normal map tiles with a Metro map so you can easily plan your journey.